Journey into the Aboriginal creation stories of the Anangu – the indigenous people of Cave Hill – on a day tour from Ayers Rock. See the creation story of the Seven Sisters, told through the ancient rock art of Cave Hill, one of Central Australia’s most significant Aboriginal rock-art sites. Hear stories handed down by elders over the generations, and take a unique look through the eyes of the indigenous people into their history and culture. This once-in-a-lifetime experience is limited to just 11 participants, ensuring you’ll enjoy a small-group atmosphere with your guide. Travel from Ayers Rock by 4WD deep into the desert of the Pitjantjatjara Lands of Central Australia and Cave Hill. On arrival you will be met by your indigenous Anangu guide, who will start your Aboriginal experience by explaining the songline of the Seven Sisters. Songlines are songs that have been sung among the indigenous people for thousands of years. They tell stories of the paths taken by the ancestors during Tjukurpa (creation time) and link different places and stories together. The Seven Sisters songline stretches from the north to the south of Australia, a distance of nearly 2,000 miles (3,200 km). The story of the Seven Sisters tells the tale of seven young women who are pursued on a cross-country trek by Wati Nyiru, a sorcerer who casts a spells on one of the sisters. You will be filled with awe and wonder as you see the story come to life through a series of stunning cave paintings on the ceiling of Cave Hill, one of the most significant ancient rock-art sites in central Australia. Continue the tale as you follow the footprints of the sisters up to the top of the cave, where you’ll enjoy 360-degree views of the surrounding countryside. See Uluru, Kata Tjuta, Mt Conner and the imposing Musgrave Ranges. During this one-of-a-kind experience, you’ll get a glimpse into the traditional way of life of the Anangu people and hear their stories of life in the desert. Great experience with SEIT tour guide, Emily. She was fantastic - she provided history and then some. Thankfully she was there as the native tribesman did not show up. Hope they are all right and not because they went on a grocery run. Other than that, even though pricey, seeing the cave and surroundings was great and again our tour guide was awesome! This day trip was a highlight of the time we spent in Central Australia. Coming face to face with art work that dates back 22,000 was incredibly humbling. The trip does as it says, and takes you deep into the desert, so be prepared for 3 hours of travel each way, with a significant amount on corrugated dirt road, but the trip is worth every bump! It's part of the experience :). We were privileged to have an indigenous host explain the story associated with Cave Hill, which added to the whole and Luke our driver/guide handled everything easily and . A very rewarding day. My husband and I traveled with our 12 years old twin boys, we found the tour very long as it took us away from Ayers Rock. 3 hours each way to Cave Hill and most on unpaved roads. Seeing the outback by AWD was interesting as we watched for wildlife, only to see a pack of Dingos, and a Thorny lizard. Our guides were very good and interesting with the knowledge of the area and the Aboriginal culture. 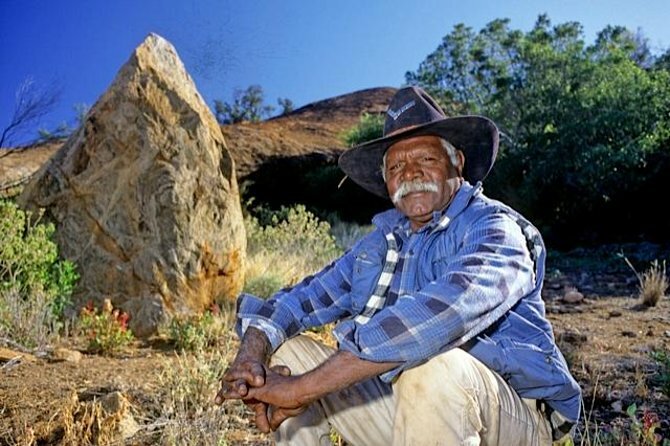 After arriving at Cave Hill we were told the Aboriginal guide was not arriving (we found out talking to others this indeed this is the case that they are often late and don't arrive)The highlight of the tour would of been if we heard directly from an Aboriginal native. Once at Cave Hill we had a steak sandwich lunch over the fire. The flies were very thick and down right unbearable, even applied some locally made fly away. My boys sat in the van while eating their lunch. With taking so much of the day, we were unable to day a sunrise or sunset tour of Ayers Rock. Be advised that even if this is an Aboriginal culture tour an Aboriginal guide may not even arrive. If your time is very limited in Ayers Rock this tour may be for right for your agenda. The itinerary is subject to change due to cultural, weather or other conditions beyond our control.